Since cube , prism , and pyramid are three of the basic solid objects found in geometry, knowing how to find the volume of cube, prism and pyramid is essential. In mathematics and physical sciences and engineering, the properties of these objects have great importance. Most of the time the geometric and physical properties of a more complex object are always approximated using the properties of the solid objects. Volume is one such property. Vcube = a3, where a is length of its edges. A prism is a polyhedron; it is a solid object consisting of two congruent (similar in shape and equal in size) polygonal faces with their identical edges connected by rectangles. The polygonal face is known as the base of the prism, and the two bases are parallel to each other. However, it is not necessary that they are exactly positioned above the other. If they are positioned exactly above each other, then the rectangular sides and the base meets at right angles. This kind of prism is known as a right angled prism. The result holds true whether it is a right angle prism or not. The pyramid is also a polyhedron, with a polygonal base and a point (called the apex) connected by triangles extending from the edges. A pyramid has only one apex,but the number of vertices is dependent on polygonal base. The cube is the easiest solid object to find the volume. The resulting value is the volume of the cube. The unit of volume is the cube of the unit in which the length was measured.Therefore, if the sides were measured in meters, the volume is given in cubic meters. Find the area of either base of the prism (A) and determine the perpendicular height between the two bases (h). 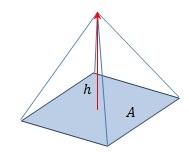 Product of the area h and the perpendicular height gives the volume of the prism. Note: This result is valid for any type of prism, regular or non-regular. Find the area of the base of the pyramid (A) and determine the perpendicular height from the base to the apex (h). Take the product of the Area of the base and the perpendicular height. One third of the resulting values is the volume of the pyramid. 1. 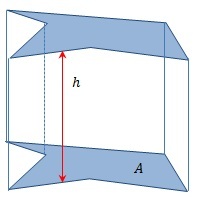 An edge of a cube has a length 1.5m. Find the volume of the cube. The length of the cube is given as 1.5m. If not given directly, find the length using other geometric means or measuring. A cube has a volume of 3.375 cubic meters. 2. A triangular prism has a length of 20cm. The base of the prism is an isosceles triangle with equal sides forming an angle of 600. If the length of the side opposing the angle is 4cm, find the volume of the pyramid. The perpendicular height is given (as the length) as 20cm. Now, we can calculate the volume by multiplying the area of the base by the perpendicular height, such as Vprism=A×h=6.9298cm2×20cm=138.596cm3. The volume of the pyramid is 138.596cm3. 3. A rectangular right pyramid has a base with 40m in width and 60m in length. If the height to the apex of the pyramid from the base is 20m, find the volume enclosed by the surface of the pyramid.